In addition to my concerns about my health and survival, however, what I am vividly reminded about is how dependent our moods and outlooks on life are on our sense of physical well-being. When we feel healthy and energetic, we are given to optimism, bonhomie and benevolence. But during bouts of malaise or pain or debilitation, our perceptions about ourselves and others, and our bountiful worldview can be dramatically upended. We become more emotionally and cognitively constricted and shriveled. Just as physical debilitation has an oppressive effect on our moods, it is well known that prolonged sadness or loneliness make us more prone to physical illnesses. I’m not telling you something you don’t know, but it’s worth reminding ourselves about the extremely close and mutually dependent relationships between our psyches and somas, or our minds and bodies. It is for this reason that there are new “Departments of Integrative Medicine,” combining forces of traditional medical specialties with psychiatry and psychology, as well as alternative healing approaches, such as mindfulness, acupuncture, nutrition, massage, exercise, meditation, spirituality and others. 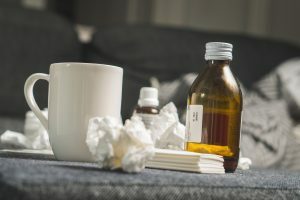 ‘Our Infernal Flu’ is caused by a seasonal virus culprit, but it has major physical, psychological, social and economic roots and consequences.